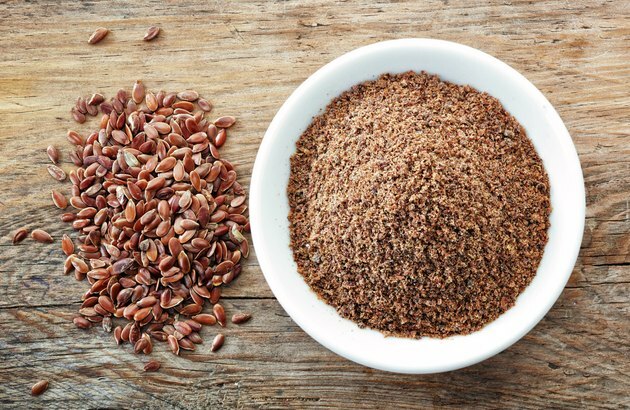 You’ve been adding ground flaxseed to your diet to reap the health benefits of this tiny seed, including prevention of high cholesterol and heart disease, management of menopausal symptoms, and even protection against some cancers. But you’ve also noticed an uptick in your discomfort from gas and bloating. Ground flaxseed may be to blame, but the culprit could also be something else in your diet or a health condition. Talk to your doctor if you experience frequent bloating. Flaxseed is known for its laxative properties because of its high fiber content. Just 1 tablespoon of flaxseed contains 3.3 grams of fiber -- between 9 and 13 percent of the amount of fiber recommended daily for adults. A usual serving of ground flaxseed is 1 to 2 tablespoons. Boosting your fiber intake too quickly can cause gastrointestinal problems, including bloating, warns the University of Michigan Health System. Start with just 1 tablespoon and work up to the larger amount, if desired, advises Healthyflax.com. When you start to take in more fiber-containing foods like flaxseed, make sure you are drinking adequate fluids. Caffeinated beverages like coffee and black tea may pull water from your body. If you are increasing your flaxseed consumption while drinking lots of caffeinated beverages, you may experience bloating. You should take in twice the amount of caffeine-free fluids, like water and herbal teas, as caffeinated, suggests UMHS. The National Institutes of Health recommends at least eight glasses of water or other noncaloric fluids daily to avoid discomfort from increased fiber intake. Your flaxseed consumption may be causing you discomfort, or it could be other foods that you’re eating in conjunction with it. Foods known for causing gas include beans, cruciferous vegetables like broccoli, pears, apples, oat bran, and yogurt and other dairy products. If you’re starting your day with a bowl of oat bran or yogurt sprinkled with ground flaxseed, the combination could be creating gas and bloating. Sprinkling flaxseed onto cooked vegetables or fruit or adding it to bean-based soups or stews could also trigger symptoms. Drinking sodas made with high-fructose corn syrup can also lead to bloating, as can consumption of fruit juices like apple and pear. Sugar-free candies are other possible culprits. If you eat a lot of fatty foods, they may slow the emptying of the stomach contents after a meal, resulting in uncomfortable bloating. An intolerance of lactose, the sugar found in milk, can likewise set off abdominal pain. When bloating occurs, make note of all the foods you ate that might have caused the distress. Consult your doctor if your bloating becomes frequent or troublesome or is accompanied by other GI problems.